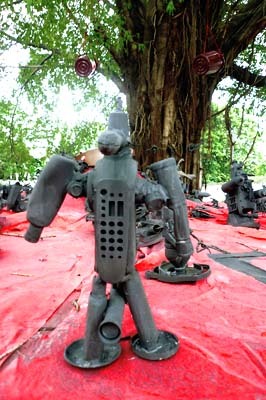 Tree monster: Toy robots made of plastic waste have been placed under a banyan tree in Theater Jakarta’s open space as part of an installation by Atap Alis Community. If you make street artists who normally thrive on creating art on a deserted overpass without getting caught by authorities work in the comfort of a contained art theater’s open area, do their creations loose the free spirit of street art? Differing opinions emerged during a press conference held last week before the opening of Jakarta Arts Council’s (DKJ) visual arts exhibition “Breakin’ the Wall: The Street Art Show”. Curator Bambang Asrini Widjanarko invited six street art communities to exhibit their works in the form of murals, art installations, 3-D illusion paintings, and balloons at the open space of the Theater Jakarta at Taman Ismail Marzuki. The exhibition, part of DKJ’s December program titled “Diluted Boundaries, Managing Diversity”, runs from Dec. 8 to 18. 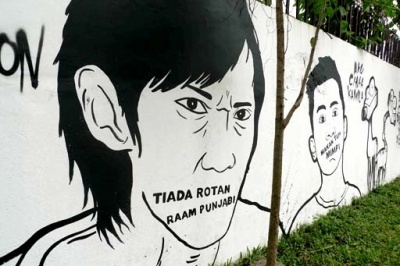 Art community Popo and Kampung Segart created a mural criticizing the appalling quality of sinetron (soap opera) on local television. 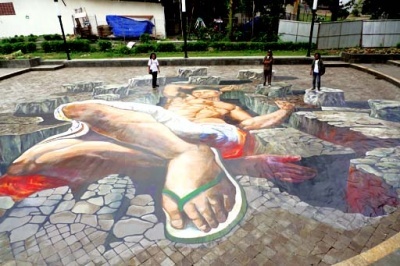 Trio Lintas Mentawai paid a tribute to the late Mount Merapi gatekeeper Mbah Maridjan by drawing a 3-D illusionist painting of a buff Mbah Maridjan falling into a burning crater. Jakarta Art Institute’s Action Painting created a 3-D illusionist painting of imprisoned tax officer Gayus Tambunan as Santa Claus. Atap Alis, headed by Baja Panggabean, recruited children to create an art installation that serves as a political parody. Art collective Xserut also created a 3-D painting of an underground Indonesian city and Amel and friends put together a balloon installation. In his introductory piece to the exhibition, Bambang wrote that the theme was “intended to help understand street art as an alternative attitude when choosing new possibilities for independently growing forms or art and their diverse realization on the street”. During the press conference, he said street artists had gained acceptance in mainstream galleries around the world. “There’s no distinction between high and low art anymore,” he said. Word play: The words “Tiada rotan Raam Punjabi” are painted under the nose of a picture of a man. Popo and Kampung Segart are playing with the Indonesian proverb “Tiada rotan akar pun jadi”, to represent the overwhelming presence of sinetron tycoon Raam Punjabi. The theme “Breakin’ the Wall” signals the fluidity of visual art, he said. “Everything is fluid now. Visual arts owes much to literature and theater. ‘Breaking Art’ also shows the use of other mediums than walls,” he said. However, art critique Yusuf Hadi Susilo Hartono, editor in chief of Visual Arts magazine, was not convinced the works presented displayed the free spirit of street art. It was, he said, a “tamed” version of street art. “There is no tension from being chased [by authorities]. It’s far from the spirit of street art,” he said, adding it was “cold”. Art writer from Surabaya Henri Nurcahyo noted the context of the art works was missing. “Art is a combination of text and context. If you take street away from street art then the context is lost,” he said. He suggested bringing context to the street artworks by displaying information about the locations of the artists’ work in the street. Bambang, however, disagreed. He argued many street artists’ works around the world had entered galleries, museums, and auction houses. There is no clear definition of what and how the ideal artists and street art works are supposed to be, he added. Ryan Popo, the founder of Popo and Kampung Segart, said creating art in the street and in the Theater Jakarta was definitely different. “Tamed is the right word,” he said. Popo, who creates murals at Jl. TB Simatupang among other locations, said that in the street, a honk of a car, a sound of someone talking can set them on edge. “Here, we can chat and have coffee and buy some time,” he said. “There is also more negotiation in the process,” he said. Despite the differing opinions, the works displayed at Theater Jakarta still hold power in humor. Popo’s works for example consists of portraits of people with words written across their faces criticizing Indonesia’s sinetron. The Indonesian proverb “Tiada rotan akar pun jadi”, which means be resourceful and use anything around you, was twisted into “Tiada rotan Raam Punjabi”, referring to Indonesia’s sinetron mogul. Lintas Melawai’s work was darker as they painted a bare-chested Mbah Maridjan with the body of Hercules falling into a crater. Larger than life: Members of Lintas Melawai stand on the 3D illusionist painting titled In Maridjan We Trust. “Mbah Maridjan is someone who held much responsibility,” Sukadi Prabhu Suti said. “That’s why we painted him in the body of Hercules,” he said. “He is someone who was pious but also held on to Javanese traditions,” he said. Atap Alis, an artist collective that opened a learning studio for children, worked with children to create toys from waste. They place the toys under a banyan tree as a political parody of the sign of Golkar, the political party that ruled during the New Order regime. Head of DKJ Firman Ichsan said that this month’s theme on managing diversity aimed to increase people’s awareness of the plurality of Indonesian society. “There are many clashes because diversity is not appreciated,” he said. “Our goal is to show people that difference is not a threat,” he said.